Lock: Manually prescheduled shifts are called, Locked shifts, and will not be altered by ByteBloc during computerized scheduling, although you may manually revise them at any time. Lock scheduled shifts are marked with the letter 'L'. Lock scheduling can also be done from the 'View and manage shift requests for providers (CTRL+ 4)' screen by simply selecting 'Lock (L + click)' on a shift from the shift menu while viewing an individual provider's request. If you have already printed and received these requests, you may prefer to enter locked shifts from that screen. Pressing the 'L' key while selecting the provider also works. Note: When a provider is selected in the provider popup using CTRL + click, then the provider popup remains open and the next shift is selected for the day. You can continue locking providers into empty shifts. Unlock: Unlock the provider from all shifts. This will remove the shift from being locked. The provider will still be assigned to the shift. Assign:Assign unfilled shifts to a provider in bulk and filter by date. Assignments will be modified for the selected shifts. Unassign: Unassign provider from shift and make temporarily off for the day from the provider menu. You can also, use the 'Clear' option in the 'Split or adjust' window to reschedule. If you need to remove scheduled shifts for a provider or assign shifts in bulk this tool will be very helpful. In the 'Providers' section of the menu, select 'Lock / Unlock'. Provider: By default all providers are selected. Categories: (Optional) Click the check box next to the 'Site' name to 'Filter by category'. All of your 'Categories' will display and you can choose one or multiple 'Categories'. Sites: (Optional) Select the check box to 'Filter by site'. All of your sites will display and you can choose one or multiple 'Sites'. Date: (Optional) Click the check box to 'Filter by date'. Choose a 'Start date' and 'End date' to include a range of dates. 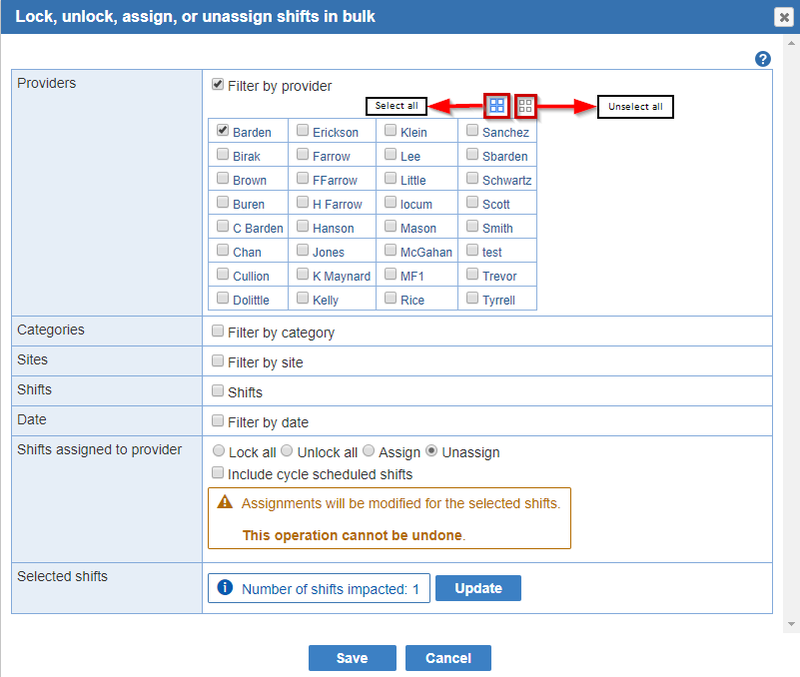 Shifts:(Optional) Select the check box to assign specific shifts to a provider in bulk. All of your 'Shifts' will display and you can choose one or multiple 'Shifts'. Selected shifts: Click the 'Update' button to apply the changes to the 'Shift counts' message. It will let you know what shifts are locked, not locked, split, and cycle scheduled for the provider selected. Note: You can only select one 'Lock all', Unlock all', 'Assign', and 'Unassign' option at a time. Also, the provider will be unassigned for all shifts other than splits and shifts cycle scheduled. This operation cannot be undone.